Tripod turnstiles are ideal where aesthetics are required. These offer security and pedestrian monitoring to an area where restrictions are required to prevent unauthorised access, whilst still maintaining an open plan feel. For example, such areas may be council offices, business reception areas, gyms, banks and financial institutions etc. They also work well with access control software for reporting for fire or time and attendance. The tripod turnstiles come in various materials and designs. 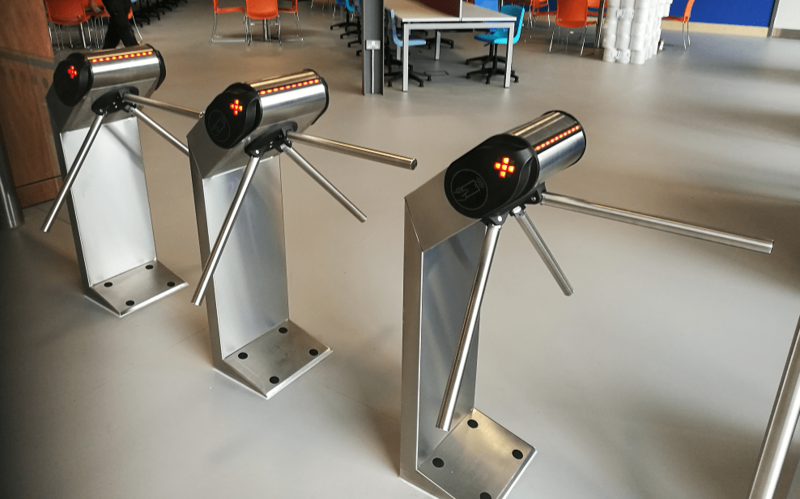 The most popular is a polished stainless steel turnstile, however, they can be mild steel and powder coated, or the tripod turnstile housing can be clad in timber to give a warmer appearance. Some of the optional features are drop down arms when a fire alarm is raised, and/or anti-jump-over alarms. This is where a beam would detect a person who contravened the system and would then set off a sounder system. Both tripod turnstiles and full height turnstiles can be supplied with Automate Systems’ pay on entry system, where a preset amount is needed before entry is allowed. This could be from twenty pence upwards and when the correct amount has been totalled it activates the coin operated turnstile allowing access. The most popular places for this equipment are public toilets in shopping malls, Train and Bus stations. The glass waist height swing gate supplied by Automate Systems Ltd is fully DDA compliant and can be operated by either a push button from reception or a card access system. The gate has a stainless steel column and is fitted with toughened safety glass. The glass gate will rotate through 180 degrees and may be activated to open away from the person using the gate. It also has a break out facility so that in an emergency the gate can be pushed open and it will stay open until re-activated when it will automatically re-set itself. The glass gate is fitted with a break out alarm, if the gate is pushed open an alarm sounds. Turnstiles fitted with biometric readers offer speedy and secure access for sites that have numerous users and where the turnover of staff for the issue of cards or fobs is so great it becomes a problem. With biometric access controls, each person’s finger print is read which, along with an assigned pin code, giving security of the highest level. This prevents passing cards or fobs back through the turnstile for someone else to use. Linked to access control software on a PC each individual can be logged on and off site and fire reports or parole can be generated from the information. Individuals can be monitored and added or deleted whenever required. The Biometric Turnstiles are often used on Building sites or large industrial plants and places where an unmanned higher security level is required. 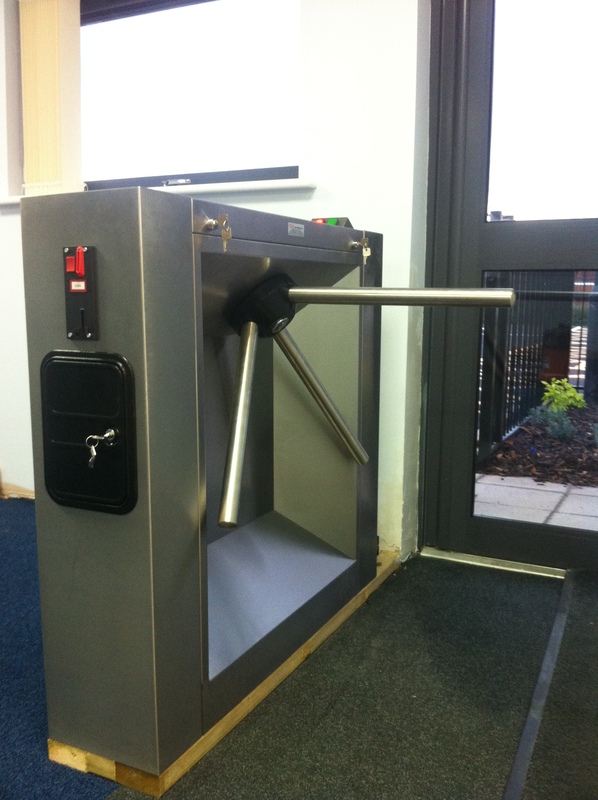 Supply and installation of a fully operational and integrated half height turnstile system.